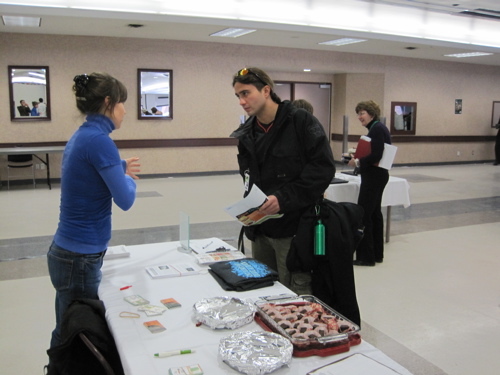 Reaching out to the student body and promoting a healthy and environmentally-conscious diet were the key messages on the table that afternoon. Also on the table were no less than two different kinds of vegan brownie samples (provided by baking enthusiast extraordinaire, Erin), which attracted even the most resistant skeptic in the crowd. It was also an opportunity to promote the NCVA to others, increase our membership base, and meet new friends of the NCVA. We sold some of our popular “Eat Like You Give a Damn” T-shirts and compiled a considerable list of passers-by highly interested in our association. It was amazing to see how many people hadn’t even heard of us. Hopefully we can encourage more volunteers to table at similar events in the future, so that we may connect with an even wider demographic. Previous PostPub night was truly revived!Next PostGeorges Laraque first confirmed Veg Fest ’11 speaker!